Keter’s Storage Cube combines seating and table top services with 55 gallons of internal storage capacity. 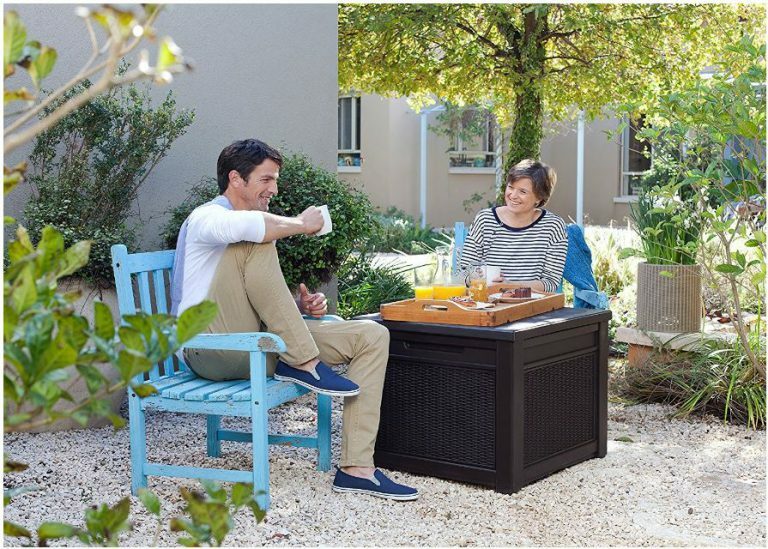 These versatile square deck box designs deliver smart solutions, enable sprucing up surroundings both indoors & out to help organise uncluttered space. Exhibiting ultra stylish appearances and triple services, the composition boasts a trouble-free cleaning operation with resistance to weather attack. The chicness of the storage cube simulates wood-slat panelling across the lid meanwhile wrapping around the fascia in-between the corner posts displays exquisite rattan effect styling. The corner posts extend beyond the box body in order to keep the base off the ground. Resin manufactures seem to have surpassed wooden constructions in a deck box style owing to wood’s inability to withstand demise through changeable weather conditions. Defending rapid deterioration through damp attack, wood requires constant yearly upkeep work to nurture & maintain their appearance only to be subject to another episode of decay further down the line. In contrast, resin requires an occasional wipe. 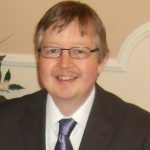 Initially we were rather sceptical with the cheesy plastic appearances portrayed through the original models however recently, technical advancements relating to innovative molding methods are producing favourable attractions whilst still remaining unsusceptible to decay. Inspect the video below to visualise how stylish the Cube complements patios. The diversity expressed through three-way services inclusive of storage and seating with a table-top design further to exhibiting favourable eye-appeal in a mini stature represents versatile usage possibilities both in the home and outside. Popular services stood indoors aid to organise home space associated with hiding outdoor shoes & boots stood in an entrance hall, a super haven for kids toys enabling quick tidy-ups, a place to store books, magazines and games sat in a conservatory, concealing work tools or anything that’ll fit in. Out of sight – Out of mind. Outside, positioned on a patio or home-yard they shelter seating covers, cushions, games & accessories meanwhile many people convert the dry internals for storing firewood throughout winter. 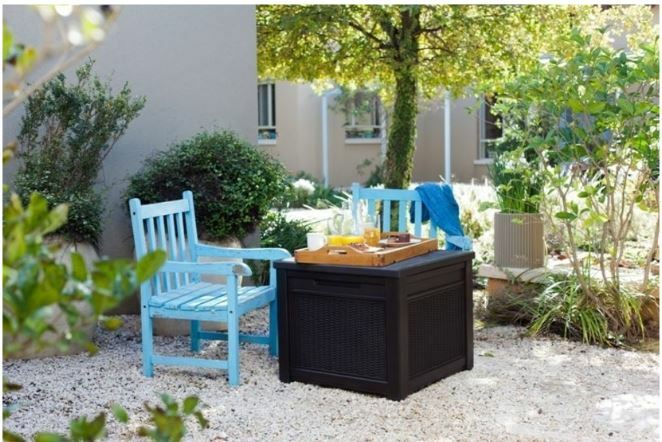 The provision for additional seating plus the flat lid paves the way for alfresco dining and accommodating drinks, super-favourable around barbecue times. Situated poolside they harbour swimming gear & towels meanwhile located on a balcony their threefold services deliver advantages for confined spaces. Potential’s quite immense. The Cube’s manufactured from polypropylene where brown pigments combine with the resin to display the richness of oak. The molding technique creates a divine wood panel effect for the lid embossing intricate grain textures within the surface meanwhile surrounding the fascia, an enchanting wicker effect artistically finishes the cube off with classy finesse. UV stabilisation properties amalgamate with the resin to resist colour change upon exposure to the sun preventing sun-ray forces bleaching and splitting the facade, a vast improvement to yesteryear’s unprotected plastic that rapidly succumbed to sunburn damage leading to disenchanted appearances, now overcome. 100% recyclable polypropylene trumpets out Keter’s green credentials. Maybe in the future this resin will be re-manufactured into the new groundbreaking deck-cube designs – Who knows! Polypropylene assures weather-rot never becomes an issue because it doesn’t decompose, the jealous aspect of a wooden structure. The cube doesn’t require painting nor wood-stain varnishing, it’s resistant from denting peeling and chipping meanwhile the composition’s immune from corrosion and decay, delivering the lazy way to outside storage. The pure advantage concerning polypropylene regards the maintenance role that swiftly restores the Cube’s immaculate presentation. A wipe down with a cloth dipped in warm water and perhaps some light detergent rejuvenates the shine in minutes. This undemanding cleaning duty captivates interest for those looking for basic simplistic maintenance, like we did – Whoopee to that! Retaining a dry internal space to prevent seating cushions acquiring musty odours during clammy conditions regards the Cube’s intended design feature. The lid slightly overlaps the fascia whereby the walls embed within the lid’s grooves upon closure, preventing rainfall dribbling in at the edges nor through the top’s one-sheet impermeable manufacture thus assuring a weatherproof structure defends against rainfall. All resin deck box manufacturers sing from the same hymn sheet with regards to designing weatherproof constructions that efficiently drain rainfall falling down upon them meanwhile their intentions are to produce a flat-pack product that swiftly constructs, virtue of interlocking panels however due to the faint gaps appearing in the interlocking mechanisms that snap their constructions together, they’re described as weatherproof, not waterproof but essentially these gaps distribute freshness to the Cube’s internals for storage preservation. The Cube’s spacious interior delivers a 55 gallon storage capacity, designed to facilitate 24 inch seating cushions to give an idea of storage dimensions. 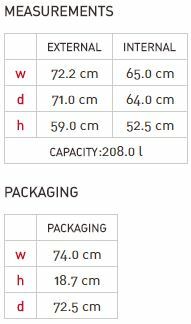 Internal box measurements are presented below to compare with your storage along with external dimensions for location ideas. Instead of a removable top, hinges function lifting the lid for access to enable swift tidy-ups at a moments notice, delivering promptness when sheltering cushions or kids toys scattering the garden when rain-showers commence. Due to the minimal lid-weight, conventional hinges provide the opening rather than gas-shocks or spring hinges meanwhile the lid stays firmly shut by a latching mechanism and pops open upon entry however this model is not lockable. Internally an abundance of resin ridges spread across the panels and lid for sturdiness. Inside, the design enhances rigidity to accommodate 66 lbs (30 kg) of storage weight meanwhile the lid supports 308 lbs (140 kg), providing a seating position for an adult up to 22 stones. The lid is purposely designed flat for table-top services. 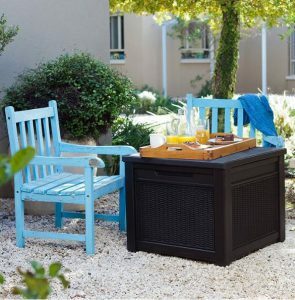 Having the potential to additionally serve for accommodating alfresco dining and drinks paves the way for positioning as a bistro side table or centrepiece to seating, enabling restricted locations to facilitate three-way services; the reason it’s a popular solution for balconies and confined home-yard spaces. Two models were originally developed for the Cube, the alternative is pictured occupying cushions above-right, displaying a wood panel effect all over. I seldom see the panelled Cube for sale whereas this rattan weave has achieved global sales, the pricing section will show whether it’s still available. If determinations are to find a swift construction, you’ve landed on the right page. Assembly equates to 4 very straightforward construction steps represented by illustrations presented in the instructions. Described as minutes to finalise construction, the majority have accomplished the build in 10-15 minutes. The procedure entails interlocking the panels into the base by clicking together, inserting 4 corner sections followed by using a screwdriver to drive in 8 screws for securing the hinges into position – That’s all what’s required! So far, I have only been introduced to Keter’s Circa round deck box that’s even quicker to install, requiring no tools. In minimal time, the box can be unpacked, constructed, filled with accessories and serving requirements situated in the desired location. Assembly couldn’t get anymore straightforward. 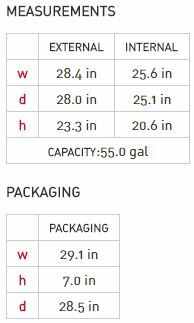 Keter’s Storage Cube delivers an internal storage capacity of 55 Gallons / 208 Litres. A mini size designed to accommodate a whole variety of storage. Able to seat a weight of 308 lbs. / 140 kg and store a weight up to 66 lbs. / 30 kg. Internal and external measurements are presented below to work out against possible storage ideas and locations. There’s plenty of various sized Deck boxes available, innovative designs are frequently being developed to aid organising all our outdoorsy accessories from mini designs up to extra large catering to accommodate the tightest of outside sitting areas upwards. Once you realise the potential one storage box delivers in clearing space, organisational ideas spring into action for additional models. It’s common to see a few different sized storage boxes scattered around homes nowadays. Compare the Cube’s competition below. 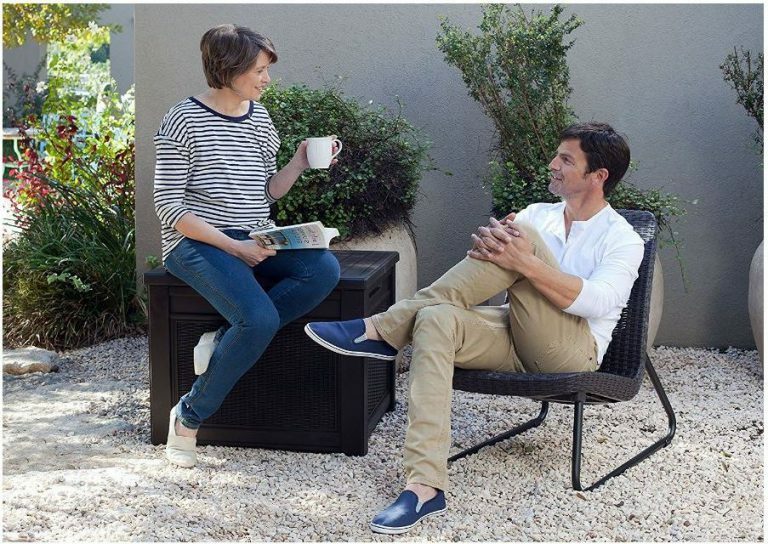 This multi-functional storage cube manufactured by Keter offers triple services: Storage – Seating – Table-Top. Maintaining a fresh & dry internal ambience, purposely designed to protect delicate fabrics such as seating cushions from rainfall showers & becoming musty meanwhile the abundance of storage potential derived from this spacious Cube also caters to shelter the likes of patio accessories, gardening tools, BBQ paraphernalia to keeping fire logs dry. Excellent access functioned by the hinged lift-up lid enables clearing space in swift time, reason they are such a popular toy storage facility. 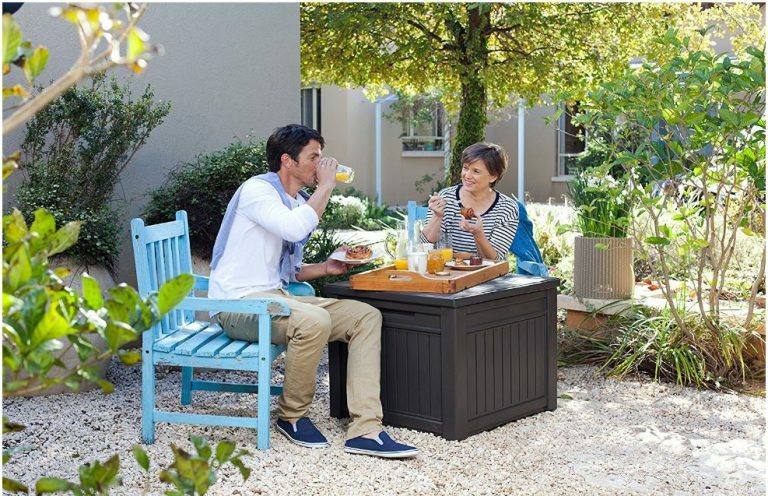 Sturdy seating supports an adult whilst the flat lid caters for outside mealtimes accompanied by a sturdy surface for locating drinks. The Cube’s weather-resistant make-up entails no future up-keep work whilst the low maintenance surface presents a doddle of a cleaning job. Couple the many benefits combined with an affordable price and two years of Cube warranty cover, no wonder they captivate huge interest. 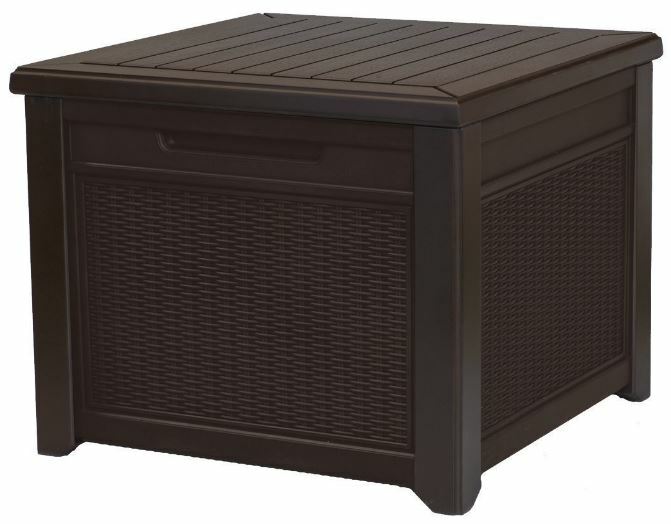 Appreciate your time reading all about Keter’s outdoor Storage Cube. Share your preferred square deck box below and any related queries, always happy to help. Please share Keter’s Storage Cube. Thank you. I found this article interesting because it is the time of year when I think about the garden, sitting out and using garden furniture. The square-deck-box-storage unit is a good size to move around and place where needed in the garden. I will not have to worry about the effect of rain or sun on it since the tough, weatherproof resin based manufacture is rot-proof. 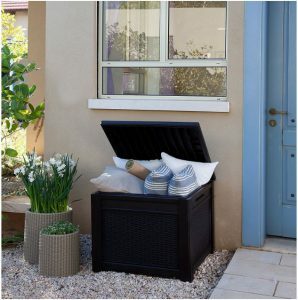 Storage of garden cushions is always a problem because they blow away in the wind, so having a quick, easy place to put them is ideal. Keter seems to have put a lot of thought into this storage box. I will certainly be considering these for the summer time. Thanks for visiting and reading about Keter’s Storage Cube. Yeah, this is the time of year when thoughts run through our minds how to organise outdoors more efficiently. 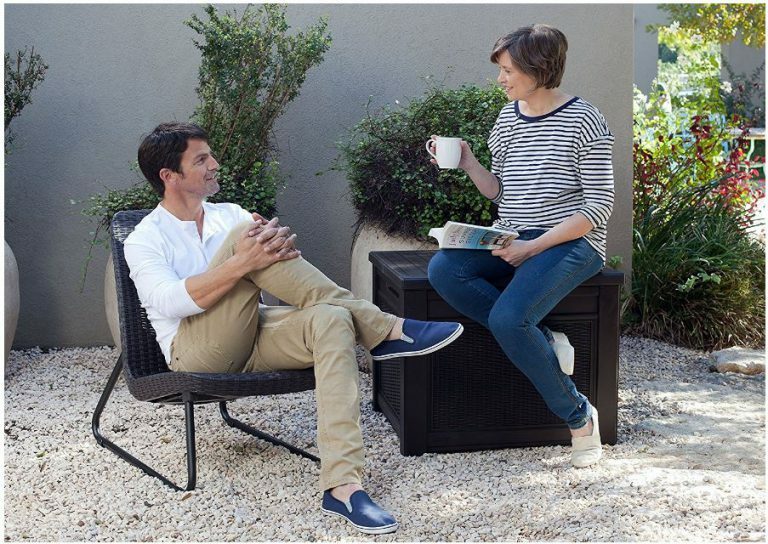 A square deck box such as this model epitomise outdoor summer living with respect to storing accessories, additional seating whilst doubling up for a table-top surface. 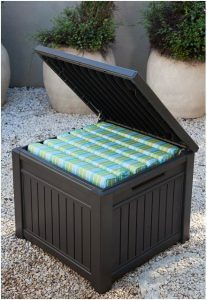 Storing outside furniture seating cushion were the reason we decided upon choosing a deck box, storage room indoors is at such a premium where to store their bulkiness. Nowadays however, it’s just a matter of walking outside, opening the deck box and in minutes the patio is all set-up without traipsing the many trips in and out of the house carrying stuff. Best bit is clearing away, in 2 minutes the deck is cleared thanks to their storage capacity, replacing all those previous hassles. UV protection prevents colour fade and cracking in the sun whilst the resin make-up is unsusceptible to rust, rot and decay, replacing upkeep work with an effortless wipe down.